My Swedish maternal great-grandparents, Gustav and Matilda Lundquist, and their daughters Edith and Lillie were among the first to attend the church. Lillie, who was my grandmother, was married by this time to Albert Ard. They and all their children, including my mother, Evelyn Ard, were early attendees as well. So then my mother, who was born in 1913, was raised in Swift. As she became the wife of John Schult and mother of three boys, she brought her family to church with her. I know I was there on the occasion of my own dedication and baptism on Nov. 1, 1942. It happened when I was only a year and a half old, so I don’t remember much about it. The pastor, Rev. Dodson, administered the water and the prayer. I have been told that Mom and Dad and my brothers, as well as other family members and friends were there. I know my family was proud of the occasion. I remember the happy anticipation on Saturday evenings when we would begin our preparation for church on Sunday. There was the traditional bath routine, in which our family all took turns. Our clothes were laid out so we would each know what to wear. There was lesson study and the usual devotional time. On Sunday mornings, we were all dressed as spiffy as we were able. Our hair was combed, and on very special occasions, I even wore shoes. Our family always looked their best! It wasn’t about competition in those days, for most families were eking out a living just like us. But it was about showing proper respect to God’s house. Seems as though we were always able to get to church somehow. If our 1937 Plymouth wasn’t running, we could get a ride from the Willis family or the Sucau sisters who lived nearby. If all else failed, there was always Jack the mule and the two-wheeled cart that Dad had made for us. It seemed as though our attendance at church was the most important thing in our lives. Now, looking back, I realize just how very important it really was. Our family lived a little over a mile east of the church and as a small boy I remember Sunday mornings when I would hope to be the first kid to arrive at church. I was allowed to climb up on a chair and jump over to the bell rope to ring the bell. The bell’s downward swing picked me up again from the floor by its momentum. My first Sunday school class was in the room under the bell tower. We moved immediately into the morning service when Sunday school ended. I sat on the front pew with my brothers and friends. We had to sit quietly and reverently during the service, so as not to distract the minister. Over the years, the ministers usually had the duties of preaching to a circuit of churches. We were taught to be always on our best behavior so as to make a favorable impression, as well as to honor God’s house. Our paternal grandfather, Henry Schult, moved to Miflin in 1907. He immediately felt the need for a good Lutheran Church and was instrumental in the founding and building of the Elberta Lutheran Church, Missouri Synod. Our dad was raised in this church and was confirmed in German Catechism in 1924, at 12 years of age. As you might imagine, Lutherans were a very matter-of-fact, almost stoic people at this time. There was no hint of the modernism that many churches know today. From the music to the liturgy, all was presented in a deeply reverent sense. Now, these people were not just your average Lutherans, they were German Lutherans. Martin Luther himself had fathered their deep faith and religious convictions. I don’t suppose there could have been a better person to teach us to respect God’s house than Dad. He insisted on our reverence in God’s sanctuary so as not to be a hindrance to worship. It was his thinking that, once the service began, you did not flinch or move noticeably until the last amen. If you did, there was a piper waiting to collect his dues, and Dad was that piper! As a matter of fact, this piper wasn’t one to wait until things got out of hand. He demanded immediate payment! My brother John Henry provided one of those early lessons for me when he was about 7 years old. Our family was in the Swift Church on one very hot Sunday. There was no air conditioning in those days, so the windows at the sides of the sanctuary were open wide to allow air movement. Hand held fans were gently swaying as the minister presented his sermon. The congregation was listening intently as this huge horsefly came in through an open window to practice flight maneuvers over our heads. Now, big flies in this part of the country were accepted as a part of everyday life, even though they can sting a bit, so no one paid much attention. That is, no one except my brother. The fly buzzed around for a minute and John Henry’s head began to move with cat-like precision following the fly’s movement. Up and down and side to side, until he finally came in for a landing right on John Henry’s upper lip. “Ptuzzzz, ptuzzzz, ptuzzzz!” John Henry jumped to his feet and shook his head violently. The sermon went into pause mode while everyone sniggered. The spit-ladened fly disappeared through an open window. Mom and Dad were sitting in the pew behind us boys and Dad had seen the whole thing. As the sermon went back to play mode, Dad quietly arose from his seat and tapped my brother on the shoulder and gave him a left nod of his head. John Henry left our pew to follow Dad up the aisle toward the church doors. They were only gone for about three minutes when they could be heard tiptoeing back in, each taking his respective seat. John Henry’s upper lip was pooched out and over his lower lip. His eyes were red and his cheeks were wet. His chin was still quivering as he attempted to stifle his embarrassment. I was sad to see my brother go through this and I felt so sorry for him. But, I was certainly determined to never give Dad cause to take me for a walk in the same fashion. Well, guess what! About a year later, I was sitting in the front pew with a couple of my friends. I was in the center aisle seat being a perfect little gentleman when my friends started playfully touching each other and jostling around in their seats. I ignored them and looked straight ahead. Then I felt a tap on my left shoulder and, looking up, there he was! The piper had come to exact his toll once again. Once outside, I tried to explain the circumstances, but Dad wasn’t listening. He walked me down the small hill to the side of the creek and commenced to beat the tar out of me. Well, maybe it wasn’t quite that bad because I still had plenty tar left. Whatever that is. When my punishment was over, I was told to return to the front pew and never let it happen again. I’m sure I looked just like John Henry did a year earlier as I took my seat. I thought Dad had been so unfair. I even considered doing something bad when he wasn’t watching, just to get even. I suppose if the truth were known, I did just that. But certainly not in God’s house! Nothing more was said about that incident for over 35 years. As Dad reached that stage of life when his sons were more like caretakers, I asked him about that time at Swift Presbyterian. “Yes,” he laughed. “I remember it as if it were yesterday.” He explained that he had been inclined to believe me, but he wasn’t certain. He said I probably did bad things he didn’t know about, so he was probably justified in his actions. He was so right! He also said he felt it was his duty to set an example for other parents who might neglect to discipline their kids. He believed in discipline as one way to show his love. Sometimes, it may be the easiest way a dad can show he cares, while still maintaining a gruff exterior. On a more pleasant note, there were some fun times at Swift that I recall. On July 1, 1945, I completed my first vacation church school. Mrs. Kaechele and Mrs. Jensen were my teachers. I was so proud to walk up front to receive my certificate. I am thankful to this day that they believed in the importance of training children. Occasionally there were get-togethers on the grounds of the church. I don’t remember what they were for, but I do recall the fare was usually beans, weenies and potato salad. Mom was involved in the Ladies Aid and Auxiliary, which were missionary support groups. For a while, Mom was even the president of the Ladies Auxiliary. I helped with one project, which was making bandages from bed sheets. Refreshments were always served, so of course I enjoyed tagging along. I always loved roaming around the grounds of the church. Just to the east, along the lane leading to the church, one could see many recognizable names on the stone markers in the resting places there under the pines. I was years before I realized so many of them had made a great contribution the church, as well as the community as a whole. To these people, I owe a debt of gratitude for their part in my own upbringing. They were the founders of a caring community and a church with a stabilizing influence on my early years. Of course, several years had passed when my wife, Katherine, and I were brought together. She, having been also raised in church, brought into our home very a similar background of faith. Our three daughters were raised with a reverence for God, just as we had been. Keep in mind as you read this account that reverence is not a set of rules and regulations. The very root of the word is revere. A large part of showing love to God is showing respect in His presence and in His sanctuary, wherever and whatever that might be. 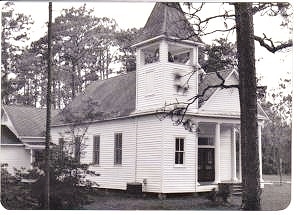 Mom and Dad moved our family away from Miflin and Swift Presbyterian in 1950. We have all returned “home” many times, and we have always been drawn to visit Swift on those occasions. Of all the places in this world I’ve seen, none compares to the beauty and serenity I find among the Miflin pines. Thank you, Miriam Roberts. I now understand the motivation of your vision and dream, as I’ve experienced that place as well. God not only brings peace, but He walks closest when we are at peace. My fond desire for my children over the next generations would be for them to seek and find Swift Presbyterian Church. Take a walk among the pines. If it’s a warm summer day and there is a gentle breeze, I know you will hear as I heard and feel as I felt.